Let’s get one thing straight right from the get go: there is no such thing as a MiG-28. Popularized in the feature film, Top Gun, the MiG-28 was, nonetheless, the subject of much speculation by Western analysts and served as the focal point for Kelly McGuiness “Charlie” character who sought more information about the plane from Pete “Maverick” Mitchel, (played by none other than box office favorite, Tom Cruise) who had a face-to-face, or rather cockpit-to-cockpit encounter with the plane from an unnatural viewpoint. Despite its notional status, Top Gun posited that the MiG-28 was a twin-engine, single or two-seat fighter jet operated by Soviet bloc air forces. As seen in Top Gun, it used wingtip-mounted Vympel K-13 (NATO reporting name “AA-2 Atoll”) missiles as its primary air to air weapon (the Atoll is a reverse-engineered version of the AIM-9 Sidewinder). The MiG was highly maneuverable, but somewhat slower than the F-14 Tomcat, its chief adversary. In the Opening scenes of Top Gun, Lt. Pete “Maverick” Mitchell and his wingman Cougar squared off against MiG-28s with no NATO reporting name and of unspecified nationality. These were nothing more than actually American Northrop F-5s, painted black for better visibility when filming and to show their ominous status. The nation that flew the MiG-28s was not specified whatsoever in the film but assumed to be the Soviet Union or another Communist state. In the script, American pilots were warned that the MiG-28 was armed with the AM 39 Exocet, a French-made Anti-ship Missile not found in the inventory of Soviet forces. In video games licensed from the films, the enemy planes are replaced with real Soviet aircraft, the MiG-29 “Fulcrum”. Interestingly, TSM Model Wings has finally moved forward and produced a 1:200 scale replica of the MiG-28. Due out this February, the MiG-28 is one of the last replicas in the Top Gun collection, as the manufacturer now gets ready for the film’s sequel, Top Gun 2. Its a bit like getting around to finally offering a TIE fighter from Star Wars as the second film gets set to debut but be that as it may, it will certainly prove to be a natural addition for anyone’s Top Gun line up. From time-to-time we get a little edgy, particularly when a manufacturer shows product at one show then fails to display it a year later at the very same venue. Such is the case with Sunrich Hobby, who, we have found out, owns Taiwan-based TSM Models, a prolific maker of diecast collectibles. At last year’s Nuremberg Toy Fair, TSM had on display several new aircraft toolings that immediately caught the hobby by storm and helped whet the appetite of many a collector. Oddly, at this year’s show, no such aircraft were anywhere to be seen, leaving this pundit in a lurch and immediately speculating that something had gone wrong. Turns out all is well in Fightertown USA according to our source at Sunrich, with work proceeding smoothly on the models shown at last year’s show as well some they cannot openly discuss for obvious reasons. If you read between the lines, that means they have locked up the Top Gun 2 license, and pretty much cornered the market on Top Gun 2 collectibles well ahead of the film’s 2020 release. We’ve already learned that the now retired F-14 Tomcat will make an encore performance in Top Gun 2, and its a well known topic of conversation that Tom Cruise, reprising his role as Pete “Maverick” Mitchell, has been seen “puttering around” in the F/A-18 Super Hornet, meaning a new aircraft will join the ranks. What hasn’t been confirmed are some of the other aircraft and drones that will likely be featured in the sequel, meaning lots more subjects to be replicated once the film hits the silver screen. For now, the Company has confirmed the imminent release of a 1:200 scale MiG-28, a mythical adversarial aircraft featured in the original film, Top Gun. Also in the works is a remake of their popular 1:72 scale flight deck, which will likely see the light of day this summer. So, while Sunrich and TSM Model Wings aren’t actually showing anything in their aircraft line up at Nuremberg this year, that doesn’t necessarily mean the pump hasn’t already been primed and product, scrutinized and approved by Paramount Films, isn’t already in the pipeline. If you’re a fan of naval aviation, and would prefer to display your fleet favorites in a non-standard format, then we have some good news to share. At long last, we have taken delivery of TSM Model Wings aircraft accessories sets, all of which were first announced back in 2015. 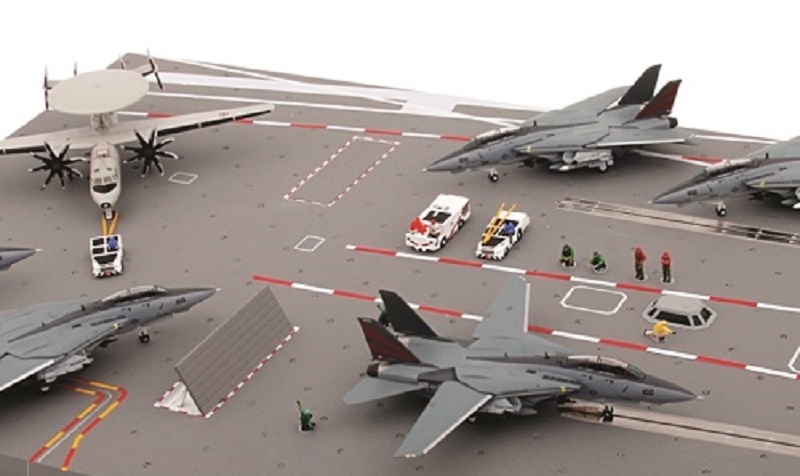 Responsible for licensing and releasing a pair of 1:72 scale Top Gun F-14s, TSM has finally “called the ball” with a 1:72 scale aircraft carrier deck (TSMWAC001), launch crew figures (TSMWAC002) and several deck servicing vehicles (TSMWAC003-5). We are already starting to run low on several of the sets, and will likely run out as we near the holidays. Announced way back in 2016, it would appear as if TSM Model Wings has finally put their stamp of approval on their long awaited range of 1:72 scale aircraft carrier deck, vehicles and launch team personnel that completes their Top Gun collection. Needless to say, these very same products are designed to work in conjunction with any type of 1:72 scale US naval aircraft, making them versatile in their own right and an excellent means of displaying aircraft in their launch mode being prepped for takeoff. Based upon information supplied to us, we anticipate their availability towards the end of August. It’s starting to get awful crowded in the Grumman hangar. We learned today of a newcomer to the model making space, TSM Model Wings, which is a brand new division of TSM Models that plans to test the diecast aviation space in a big way. To mark the occasion, they plan to kick things off with a pair of 1:72 scale F-14 Tomcats that were employed in the smash hit feature film, “Top Gun.” Amazingly, its been 30 years since the film was released to its adoring public, and comes at an especially important time, since a sequel is already in the works and expected to make its theatrical release in 2017. Two of the central aircraft depicted in the film are being replicated – the first flown by “Maverick” and “Goose” while the other was piloted by “Iceman” and “Slider”. Additionally, several combat accessories are also in the works, including a flight deck, tow tractors, fire fighting equipment and even several flight deck crewmen. Currently, we anticipate the aircraft to buzz the tower some time in January, while the accessories are earmarked for a December release.